Wide choice of bars and restaurants means you’re not likely to get bored – buffets also offer huge variety and different themes. The curries on the Maldivian evenings are yummy! This really is a place where you don’t have to bother packing shoes as you can happily spend your whole time there barefoot – but if you really must, a pair of flip flops will more than suffice! Varies from 20m to in the sea! 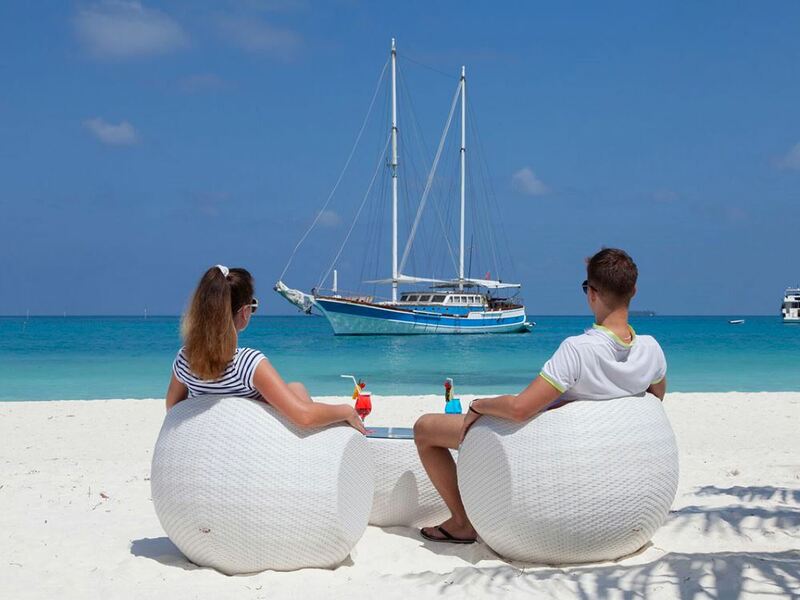 If you’re one of those people for whom the idea of spending a week on a tiny island with nothing to do has you waking up sweating and screaming in the middle of the night, then Meeru is your ideal Maldives island holiday option. Meeru is one of the larger resorts in the Maldives with a pretty chunky 286 rooms split into various room types – yet it somehow still triumphs in never feeling overcrowded or “holiday club-ish”. That’s largely because it is situated on one of the larger islands in the Maldives (about 1.2km long and 500m wide) and boasts lush vegetation and loads of beaches to choose from - and unlike a lot of other islands, there's no other islands nearby, (aside from one very small one, which is not a holiday island, and therefore is very quiet, and not near most accommodation) which means it's very peaceful, with unspoiled views. So there’s plenty of space to wander and explore, and loads of activities to keep yourself occupied – not to mention a range of restaurants and bars to keep yourself well entertained. What Meeru has managed to do so well is hide its bulk with the rooms mainly hidden in the lush vegetation that lines its sandy beaches. They’ve also avoided the typical big resort trap of cementing everything over – instead sandy pathways and floors are the rule, even in the restaurants where you can sink your toes into the sand! This really is a place where you don’t have to bother packing shoes as you can happily spend your whole time there barefoot – but if you really must, a pair of flip flops will more than suffice! With the price of drinks in the Maldives enough to make most people’s eyes water, going All-Inclusive is very popular as it is typically more cost effective – although Meeru’s AI package is limited to only certain drinks and also doesn’t include the speciality restaurants like the gorgeous over-water Asian Wok (fantastic teppanyaki!) or the restaurant boat, the Hagern. There are more land-based activities to choose from than at most islands what with tennis courts, a golf driving range, pitch ‘n’ putt course, gym and even a full size astro-turf soccer pitch! For a real treat, book yourself in for a “his ‘n’ hers” couples massage at the over-water Spa finished off with a bottle of bubbly to take away! On and below the water there’s also plenty on offer – a dive centre, kayaks, windsurfers, and fishing being just a few - you can even hire digital underwater camera kit if you like. This is probably not the best place to come for snorkeling to be honest though, as Meeru lacks a real house reef – whilst you will see rays and reef sharks snorkeling off the island, daily snorkeling trips to a reef about 15 minutes away are more rewarding to real snorkeling enthusiasts. So all in all Meeru offers plenty to holidaymakers of all kinds – whilst you’ll always see people around you, the island never feels crowded. If you are looking for an activity filled holiday, Meeru is one of the best in the Maldives. Similarly, with a big chunk of their guests being honeymooners and couples, you’ll always manage to find peace and quiet. It’s a tricky balancing act that Meeru consistently manages to pull off with huge success!